As of late, I have been immersed in what is known as YA (Young Adult) fiction. It happens to involve a lot of ‘end of the world’ type scenarios. It is here we usually read of a hapless teenager who has found him or herself in a dystopian society where survival of the fittest is the order of the day. They fall chastely in love with another luckless adolescent or mayhaps a vampire, all whilst changing the course of history. I have come to the conclusion that if I were to be suddenly transported into such a scenario, I would not last long. I would simply poop my pants and suffer a major heart attack whilst being shot at/hunted by mutated animals/jumping from train to train/taking part in a battle to the death or wearing a shimmering on fire mockingjay type outfit. I would be the sad loser who lay down and just died of fright. With that, I give you this old school Weet-Bix slice. 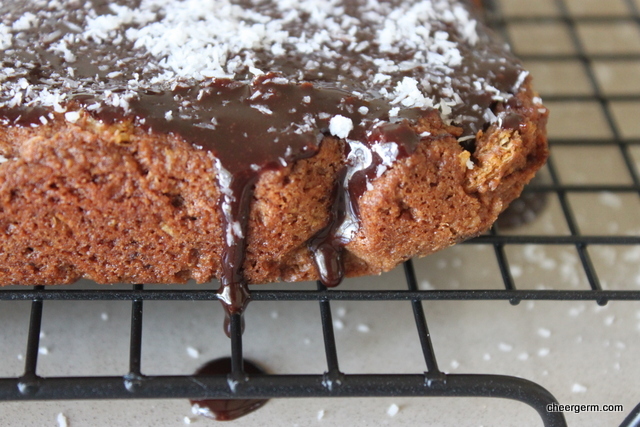 In my own adolescence there was often a version of this wheaty bake waiting at home. Made by mum in an attempt to ward off any ‘Hunger Games’ type scenarios that may have occurred between myself and my three sisters. In turn, it is now one of my lads fave morning or afternoon tea delights. My mum usually baked a melt and mix version but I have provided here a creamed butter and sugar version from my fave NZ baking cookbook, ‘Ladies: A Plate’. This slice is named Scott’s Farewell Square due to the fact that the famous explorer Captain Scott’s last expedition, sailed from Port Chalmers New Zealand, in November 1910. Alexa Johnston, the author of this cookbook, tells us that the recipe appears in a 1960’s Dunedin church recipe book. 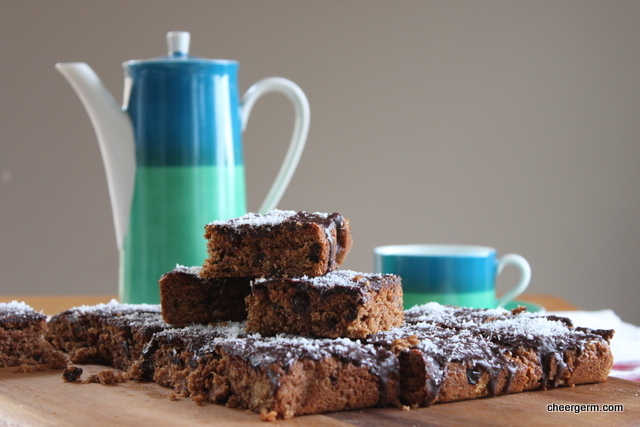 She imagines that a plate of this moreish slice may have been given to the ill fated Scott and his team before they sailed away to the South Pole. Cream butter and sugar together in a mixing bowl (I used a mixer) until light and fluffy. Add the egg and golden syrup and mix until it comes together. Sit in the flour, salt, baking powder and cocoa powder. 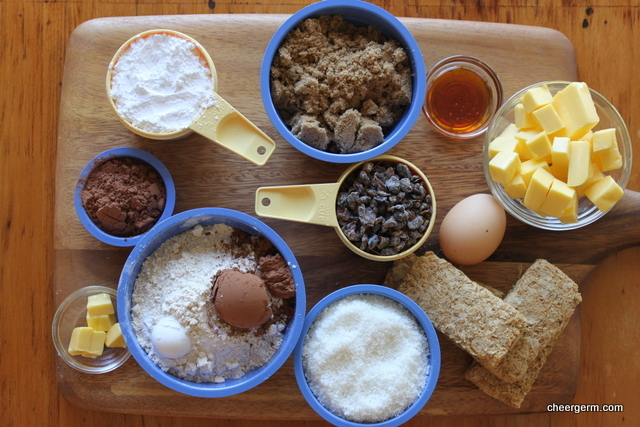 Mix in the Weet-Bix, coconut and dates and stir thoroughly to combine. 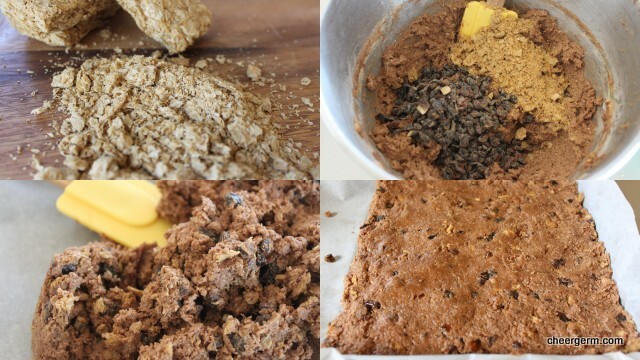 Spread evenly (about 1.5cm – 2cm thick) into a baking tin and bake for 15-20 minutes. Remove from the oven, let cool in the tin for about 15 minutes then put on a wire rack to cool. Sift the icing sugar and cocoa together into a bowl. 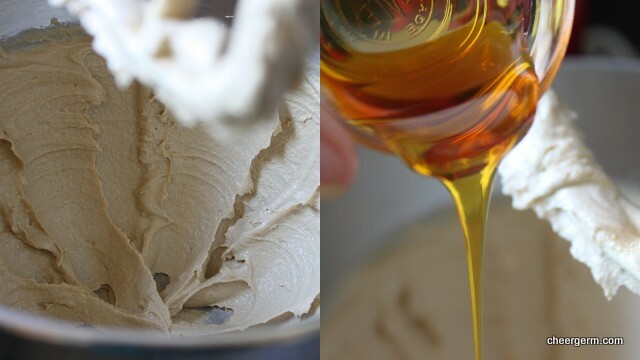 Make a thin chocolate icing by adding the melted butter and a little hot water to mix to a spreading consistency. 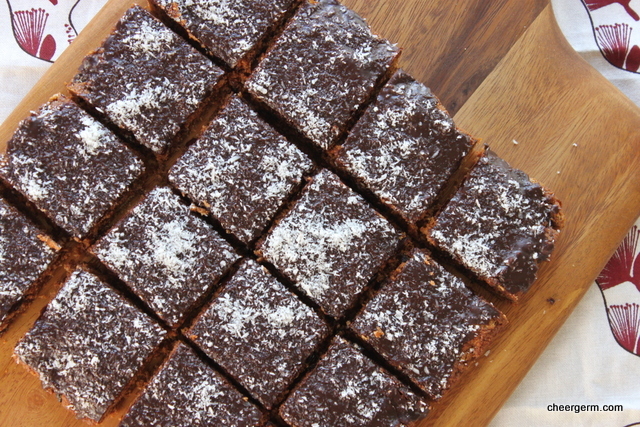 Spread over the cooled slice, sprinkle with the extra coconut and cut into squares when the icing has set. Cooking Notes: the original recipe also calls for 55g each of raisins and chopped walnuts. I leave them out due to sproglets preferences but feel free to chuck them in. I have knocked back the amount of sugar and icing sugar from the original recipe and used wholemeal flour. A Slightly Cheergerm adaptation from ‘Ladies A Plate’ by Alexa Johnston. 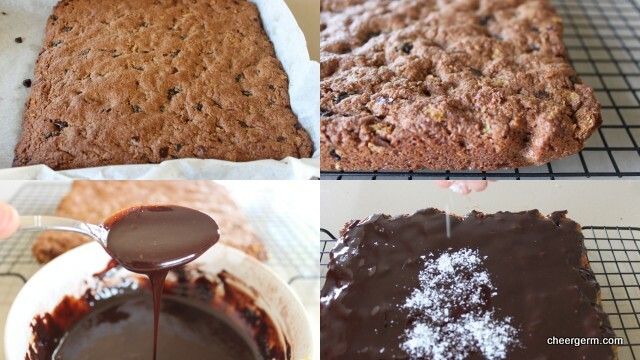 A gluten free Weetbix made from sorghum was recently released in Australia so a GF version slice will be posted in the near future, as well as a melt and mix chocolate Weetbix slice recipe. 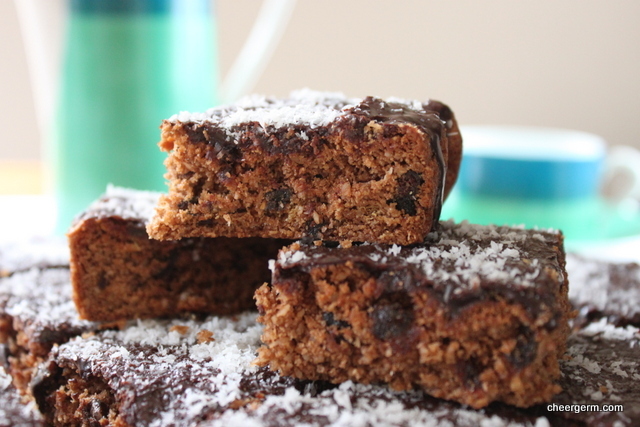 This entry was posted in Family memories, Old school baking, Ponderings and tagged baking, Captain Scott, cheergerm, chocolate Weet-bix slice, Cooking, family, Hunger Games, recipes, Scott's Farewell Square, Weet-bix, Weet-bix slice, YA Fiction. Bookmark the permalink. Looks very tasty and not dissimilar to an old one of my own. Will happly try this version, with moreyummy bits in it, since I have a few vita brits / wheat bix lurking around. I must say I enjoy the addition of the yummy bits! I went to take a squiz at your version to refresh my memory, I do like the melt and mix recipes as well. It’s a great way of using up our crushed leftover weet and vita bix hey! Fancy that, a Weetbix recipe. Healthy and tasty at the same time. You say that you have been immersed in YA fiction. Are you a teacher? You crack me up Cheery, I imagine there is never a dull moment when you’re around! I think the Aussie/NZ alliance is close than we realize, yummy simple and economical slice were my Mum’s mainstay too. You could force feed the attackers gluten, they would finish them off!! The YA genre has changed a lot! When I was a kid there was Judy Blume’s “Are You There God? It’s Me, Margaret,” which talked about the issues in a tween-ager’s daily life. Now there are mutants and apocalypses. I know! I read Judy Blume as well. The closest I can think of to today’s YA torturous scenarios is Lee Hardings ‘Displaced Person’ which was rather creepy and frightening now that I think about it… Far worse than making out with a vampire! Glad you liked the photos! I adore golden syrup as well, I have used Lyle’s but mostly I use our more common sugar brands version. (CSR) It’s used in quite a lot of old school NZ and Aussie baking. I hope poor old Scott and his crew had some lovely treats before they left NZ. Crikey, it all went down hill after that! Yes, why all the creepy and disturbing stuff in today’s YA fiction? I would have disliked that. A little dystopia goes a long way. Brilliant! We were having a ‘conversation’ at work last week; what’s best: Weetbix or Vita Brits? Vita Brits won. I don’t know if it was a NSW vs Vic thing. But either way, these look super tasty! Indeedi. It must depend on what you grew up eating. Bit like Vegemite vs Marmite! And to top it all off, I’ve got a nearly perfect dram to go with it. A bottle of Ernest Shackleton’s South Pole Nimrod Expedition’s Whisky. YUM! Must have something to fend off the oncoming cold–and a bow and arrow won’t quite cut it. I don’t think you took that too far at all! Anything for a slice of the action? Maybe I can be the disaffected chef who when the rebellion starts, throws cream pies at the advancing enemy as its my only defence? Um, on second thoughts, I think I will let you work on it…. 😁 How appropriate is that whisky for a Captain Scott type scenario? A nip o that and a bite of this slice would keep any adventurer such as yourself, warm. Looks damn tasty. 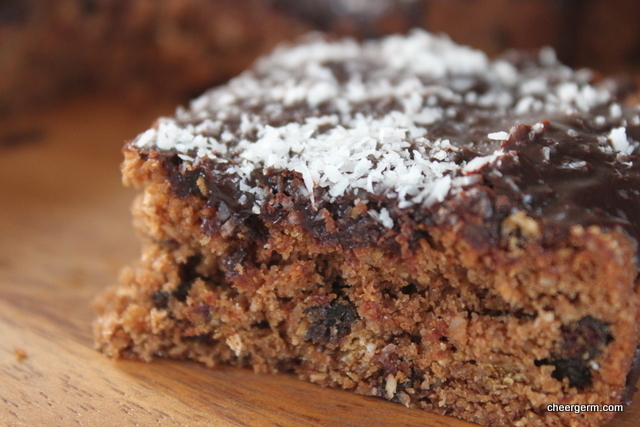 Who would’ve thought of weetbix in a chocolate slice… A little old lady probably.. Well, good on her! We’d all like to think that.. Damn your squares look so much better than our effort. I’m minded to show the boys this post and remind them that, should armageddon befall us, I will be expecting their unquestioning support. Lolol I always call it The Hungry Games too! I just finished the Mockingjay, so good. I miss all my young hero friends.. waaah.. Team Peeta All the Way! Ah, I hear Ye pain. So sad when a book series come to an end…have you read the Divergent series yet? Ha! I sound like a YA fiction pusher! I think today’s society will be more concerned with survival of the fattest:) Love the recipe and thanks for the follow.